Arsenal fans are fuming with striker Pierre-Emerick Aubameyang after a poor first-half showing against Tottenham. Even though the Gabon international opened the scoring with a well-taken penalty, he missed some chances too, including one very promising one that happened to be offside anyway. It seems many Gooners are not at all happy with how Aubameyang is playing for them today as they went in at half time 2-1 down to their rivals Spurs. 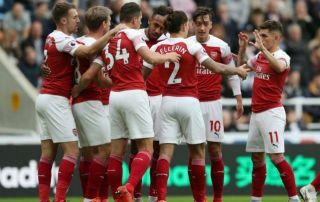 Aubameyang scored first to make it 1-0 before goals from Eric Dier and another penalty from Harry Kane gave the advantage to the visitors. Many Arsenal fans are now calling for Alexandre Lacazette to come on as they vent their anger at Aubameyang for his unconvincing performance in this big derby match. can't count how many times aubameyang has been offside today????? I love Aubameyang, but Lacazette is a better CF. Better suited for how we play!